Delgirl are a three piece acoustic group who do as much avoiding of definition as they can. If pushed they'll admit to playing skiffily, folky, country, jazzy, bluesy roots music with a Pacific edge bordering a swamp. The result is a beautiful big harmony sound built around the double bass, guitar, ukuleles, banjo, snare & percussion. These Southern gals have been making music together since 2000. Their debut album ‘Two, maybe three, days ride’ received great acclaim and was awarded the Tui NZ Folk Album of the Year for 2008. Their second recording ‘Porchlight’ released late 2009, has also received rave reviews. 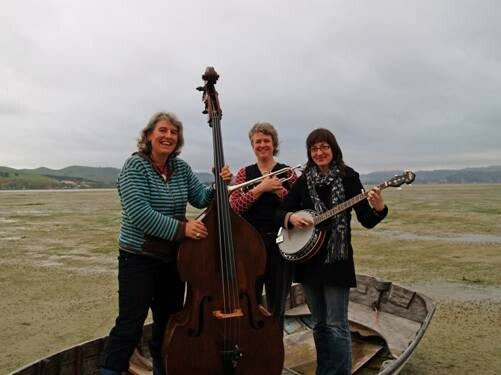 Deirdre Newall is a talented double bass player who has played in many bands over the years, including the T&D Bigger Band who were finalists in the Folk section of the NZ Music awards 1997. Proud of her Scottish and Irish ancestry and their folk traditions, her songwriting and vocals also shine a torch for old time country, roots reggae and punk music. Her passion for the natural world leads the audience from songs about livestock to plastic flotsam and jetsam and bored dogs. Having spent years on the road playing fiddle in the folk scenes , Erin Morton eventually switched to her true love - the guitar. This multi talented musician, singer and songwriter also plays a fine ukulele and can literally claim to blow her own trumpet. Her early folk roots are evident in the strong story telling tradition her songs invoke and her delight of everyday things. A NZ Music Award finalist as a member of the T&D Bigger Band (with Newall), she has played in many bands over the years. Singer, songwriter and musician Lynn Vare’s arsenal of instruments is as eclectic as her Ngā Puhi, English, Irish and French ancestry. Leaving behind the piano and flute of her youth, she picked up the ukulele, banjo, snare drum and triangle when she formed Delgirl with Newall and Morton in 2000. Writing songs about love, life and death, with the odd murder thrown in for good measure, her songs are rooted in the old time music and singalong traditions of her upbringing.